The Rapids are a series of reference and revision pocket books that cover key facts in a simple and memorable way. Each book contains the common conditions that students and newly qualified nurses encounter on the wards, in the community, and on placements. Only the basic core relevant facts are provided to ensure that these books are perfect and concise rapid refreshers. 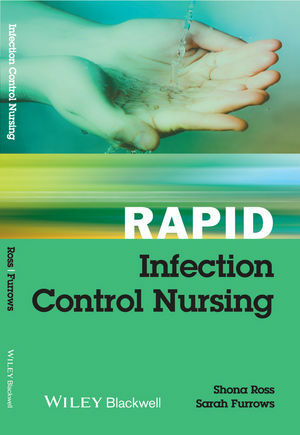 Rapid Infection Control Nursing is an essential read for all frontline nursing staff working in hospitals or community settings. Designed for quick reference, it explores the essential principles of infection control before moving on to an A-Z of the most commonly found infections. Each entry covers how the infection is spread, duration of the infectious period, key infection-control precautions, staff considerations, visitor information, and patient transfer advice. Covering all the key topics in infection prevention and control, this concise and easy-to-read title is the perfect quick-reference book for the wards. Shona Ross is Clinical Nurse Specialist in Infection Prevention and Control at Kingston Hospital NHS Trust, London, UK. She is a member of the Infection Prevention Society (UK) (formerly Infection Control Nurses Association) and the Healthcare Infection Society. Sarah Furrows is Consultant Microbiologist and Infection Control Doctor at Kingston Hospital NHS Trust, London, UK.